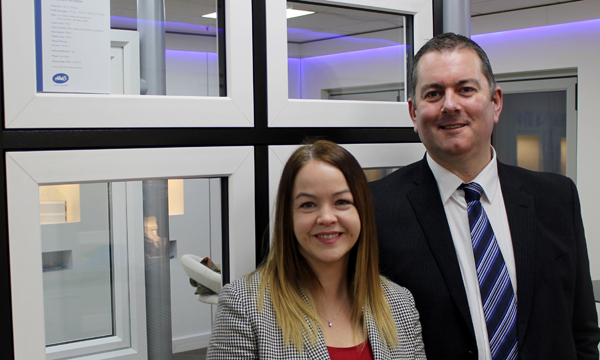 Image Above: VEKA’s newest directors: Dawn Stockell and Neil Evans. As an industry-leading PVC-U systems supplier, The VEKA UK Group has always been proud to employ the best technical and business minds. The Burnley-based company is now delighted to introduce two new members of the team; Dawn Stockell, Marketing Director and Neil Evans, Sales Director. New to the fenestration industry, Dawn comes from the electronics sector bringing a wealth of experience in product & proposition management, partnership programmes & marketing communications, most recently holding the position of Head of Brand – Northern Europe at LG Electronics. Neil joins The VEKA UK Group from within the fenestration industry, having been Sales Director at VELUX for the past decade. Dawn explained what attracted her to The VEKA UK Group and what she hopes to achieve in her new role: “VEKA stood out as both a Global and UK leader with a true ‘think global, act local’ approach to business. The company is obviously already an industry leader and I’m keen to use my skills and experience to add value. Through re-defining the marketing strategy and remaining focused on our company vision, I believe there is opportunity to drive profitable growth. “Aligned to my experience, my responsibilities include product & proposition management, marketing communication together with research & insight areas of The VEKA UK Group, to deliver a focused marketing strategy for The VEKA UK Group. Neil’s previous experience will stand him in particularly good stead for his position within The VEKA UK Group: “I’ve been involved in quite a few things including procurement, project management, running a large call centre, developing sales strategies, defining standards, working with lean in sales and customer service and developing an industry-leading sales team. I’m sure that most of that should come in handy! “I’m excited to take the opportunity to influence positive change through our team and for our customers. I think there’s a chance for us all to re-examine what we do and why we do it, and then work together to build on our current levels of effectiveness. MD Dave Jones was happy to welcome Dawn and Neil to the team: “I’m very pleased to introduce our newest Directors. The interview process was not a simple one, and with so many talented candidates it was naturally very competitive. We’ve already done our bit to make them feel welcome here at The VEKA UK Group, and I know they’re both looking forward to getting to know our customers.